Hello Joseph! Thank you for your feedback. We are appreciate it. All the best, FrenchPressCoffee.com. I am very happy with my purchase. The container looks nice sitting on my counter, and more importantly the specially-designed Airscape lid really helps keep my coffee fresh longer by being able to press the excess air out. There was a problem with the bamboo cover but customer service quickly responded to my email and they sent me a brand new replacement free of charge. If keeping your coffee fresh is important to you, then I highly recommend buying this Airscape container from French Press Coffee because they will make sure that you are satisified with your order (and you get complimentary coffee-flavored candy samples and free stir stick). Thank you Dennis! We are appreciate your feedback. Enjoy your coffee. Yours FrenchPressCoffee.com team! air, moisture, heat, and light. Truly airtight storage: The Airscape Ceramic Coffee Canister has a patented inner lid that makes a fun sound when you push down on it so you know that it is working and driving all of the fresh destroying air out of your canister and extending the life of your beans. Toxic-free, environmentally-friendly materials: The canister is made out of BPA-free materials and includes an attractive and sustainable bamboo lid. Elegant storage solution: The Airscape Coffee Canister is made out of beautiful glazed ceramic, offering an attractive storage solution for your home or office. The canister also comes in a choice of four modern colors to suit your personal design tastes. 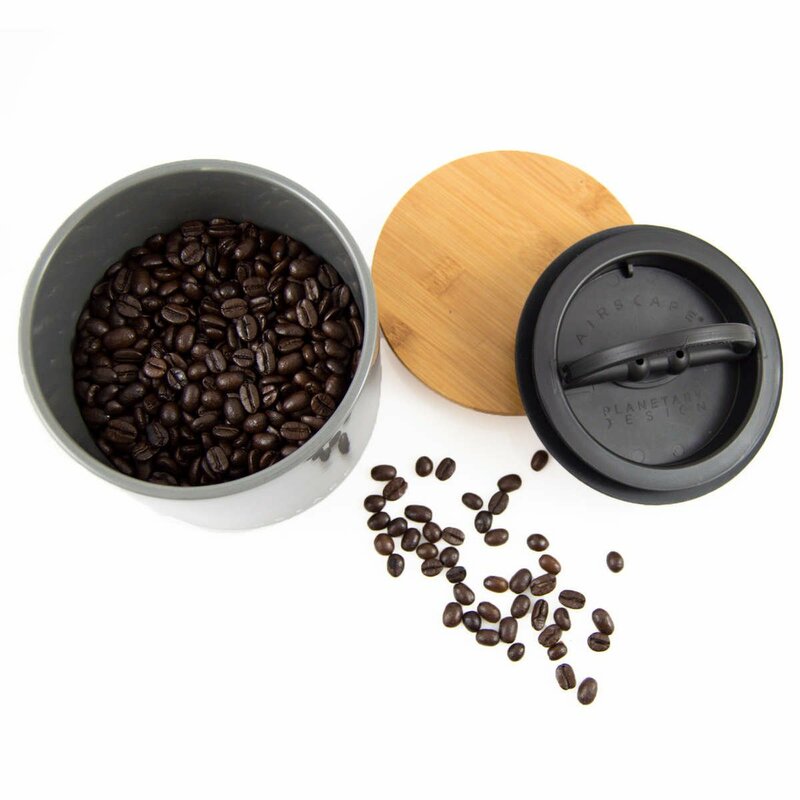 Professional quality coffee bean container: The Airscape Ceramic Coffee Canister is made out of restaurant grade ceramic used by professional baristas and chefs. The canister locks into place to drive air out of the container to both keep your beans and foodstuffs fresh, but also to protect them from the moisture of a busy kitchen. Choice of storage sizes: The Airscape comes in a choice of two different varied sizes to suit your needs. Whether you're a frequent coffee drinker or have a large household or if you enjoy the occasional cup you can select from the two sizes to hold the optimum amount of coffee beans, tea or even flour, sugar, rice, cereal, or other foodstuffs. The Airscape Coffee Storage keeps your foodstuffs fresher for longer so you don't have to worry about stale beans. For true coffee connoisseurs having optimal beans is crucial to the perfect brew. Yet the quality and taste of coffee beans depends a lot on how they are stored. Many food storage containers lock in air along with their contents. This air can destroy the fresh, crispness of your coffee beans. The Airscape Ceramic Coffee Canister is different. 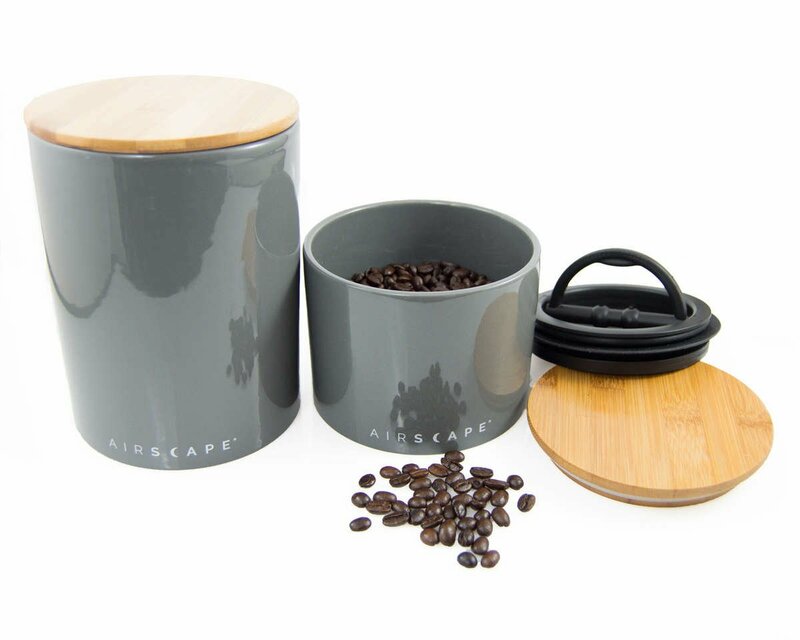 The Airscape coffee canister provides truly airtight storage by forcing all the fresh destroying air out of the canister so that your coffee and espresso beans don't dry out or become stale. This act extends the life of your coffee or tea and even sugar, flour, cereal, herbs, seeds, nuts, pet food, and other perishables. The Planetary Design Airscape also offers a way to upgrade your coffee experience. You no longer have to store your beans in the waxed bag they came in. The Airscape Ceramic Canister is made from restaurant-grade glazed ceramic with a unique lid that acts to remove air from inside the canister itself. The classic glazed ceramic canisters are also an attractive addition to any kitchen. Their glossy outside is complemented by an elegant bamboo top lid.